Basement Mold: Health Risks and Mold Prevention Tips | News and Events for Basement Systems, Inc. Mold grows best in warm, damp, humid conditions, and as a result the basement and crawl space are some of the most common areas of mold growth in a home. Mold can grow extremely quickly if left untreated in a moist environment, and it reproduces by making spores which spread throughout the air and can soon affect your entire home. Not only can mold severely damage organic materials such as wood, it can also pose a serious health risk for you and your family. 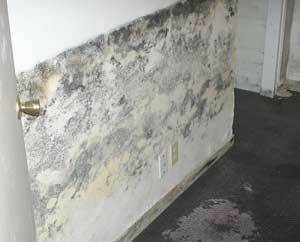 In fact, house mold may already be impacting your daily life without your knowledge. That's why we here at Basement Systems, Inc. want to offer the following warning signs, mold allergy symptoms, and mold prevention tips – so you and your family can stay healthy and safe! If you've been experiencing health symptoms such as congestion and watering eyes, pay attention to whether these symptoms seem more severe when you're in your home versus when you leave the house. You could be writing off mold allergies as a common cold, while your mold issue is only growing worse inside your home! Some other warning signs of a mold infestation include foul, musty odors in your home and visible mold in damp areas such as basement walls and floors where moisture collects. Since mold thrives in damp spaces with high humidity levels, some of the most practical methods of mold prevention include moisture control and humidity control. Basement Systems, Inc. offers extensive basement waterproofing and crawl space encapsulation services that will make a significant difference in preventing mold growth in your home. Keeping your basement dry with a basement waterproofing system will effectively protect the space from excess moisture and resulting mold growth, while sealing your crawl space can perform a similar function in preventing water damage, wood rot, and mold. It's also important to remove the mold-damaged materials and replace any vulnerable organic materials, such as wood, with mold-resistant replacements. Basement Systems, Inc.'s high-quality basement wall products, mold-resistant basement ceiling tiles, and basement flooring options will retain a natural appearance while staying watertight and mold-proof for years to come. We can also restore your indoor air quality with Energy Star-rated basement and crawl space dehumidifiers, which will filter out mold spores and ensure that the air you breathe is healthy and safe. By taking steps to waterproof and protect your basement and crawl space from moisture, humidity, and mold growth, you can make a significant difference in the overall health of your entire home! Contact your local Basement Systems dealer to find out more about mold prevention, crawl space vapor barriers, basement waterproofing, and the difference they can make for you and your family.